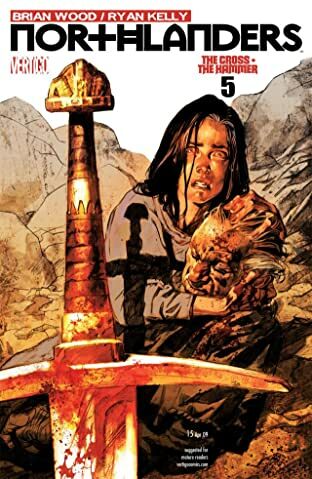 Three weeks ago I read Northlanders: Sven the Returned (Book One) and I said “This is a series (that continues on with different characters and dates) I will not continue.” Yet…here we are. When I heard that Book Three included a short story on Sven whose story was all of Book One, I ordered it. Then I thought, well, I should get Book Two just to keep it in order. Damn it all- I was hooked. While Book One had taken place in AD 980 on the Orkney Islands of Scotland, this story takes place in occupied Ireland in the year AD 1014. The story centers around brute father Magnus and his pre-teen daughter Brigid who are on the run. Former monk Magnus is on a crusade to kill as many of the King’s men as he can while defending his homeland, despite having his beloved daughter by his side. Lord Ragnar, using unlikely detective skills (for that era) tracks this vigilante. But Ragnar is no noble Norse leader; he and his fellow soldiers leave as much destruction as Magnus does, each feeling their cause is worthy and justified. Then the last chapter pulls the rug out from under you, and everything you thought about this father and daughter is suddenly upended. I had to re-read the concluding pages several times to truly understand what had just happened. Not all the pieces fit (you have to have a suspension of disbelief) but I applaud the author Wood for trying something new. The artist is Ryan Kelly, different from the artist in Book One, and he ably recreates the Irish countryside and it’s inhabitants. The men are rugged and battle weary, but Brigid is always drawn as a beautiful waif, making her a studied contrast with her father. This volume is broken into several vignettes (similar to how Wood wrote Rebels), where as the two previous books dealt with one extended story at a time. While I at first only planned to read the last chapter about Sven, I was sucked into the other stories, that were all drawn by different artists. Lindisfarne– Northern England AD 793: Teen Edwin hates his bitter father and older brother and when Vikings land near his home he leads them straight to his village. Conniving Edwin sides with the Northlanders and forever turns his back on his Saxon kin. The Viking Act of Single Combat– Northern Europe AD 790-1100: Six generations of two neighboring lords battle regularly. Two ugly Vikings battle to the death. Whatevs. The Shield Maidens– Danish Mercia AD 868: Three widowed Danes escape and become shield maidens who were women warriors who fought alongside men in Scandinavian folklore and mythology. They escape to an abandoned Roman fort and defend themselves against the invading Saxons. Fate is intertwined into the story, so how they succeed seems less due to their own prowess than just luck. The very dark coloring and lack of individualization of the three women made this female-centric story less powerful than it could have been. Sven The Immortal– Oslo Norway AD 1009: Sven and Enna are back! As is original artist Gianfelice and his issue with eyes! Sven has been in exile for several decades when young men who want to prove their manhood by killing the fabled Sven Of Orkney, decide to find him. Sven sends his two children into hiding, and he and Enna prepare for the attack. These young bucks underestimate the greying Sven but he shows them that he can still battle with the best of them. While I won’t spoil how he and Enna persevere, I will say that I was extremely happy with the ending. Sven- who knew that your character would end up being so appealing to me? Wood, Brain & various artists. Northlanders: Book Two + Three. 2009 +2010. This post made me inordinately happy for a comic series I’ve never read. But I just kept thinking what a wonderful surprise it is to read a book you feel so-so about, not plan on reading the sequels, and then you get totally hooked on the next two volumes! I’m happy you found this surprisingly engaging. Yes, I was so against Sven in the first book, yet I wanted to read his concluding arc. He matured and became a better man, mostly because of Enna. But as a history fan, I enjoyed the other stories that gave windows into other Viking eras.